The Gardens of Hartford is located at 112 Peace Lutheran Parkway in Hartford, WI. This beautiful 48-apartment community features a number of services and amenities that not only provide a family-centered atmosphere, but also peace of mind should health issues arise. In addition to well-appointed apartment homes, the community boasts a number of beautiful common areas including a spacious dining area, private rooms to gather with friends and family, fitness facilities, a library, a beauty salon, and picturesque gardens and outdoor terraces. We also have a full calendar of activities and social outings to keep our residents active. 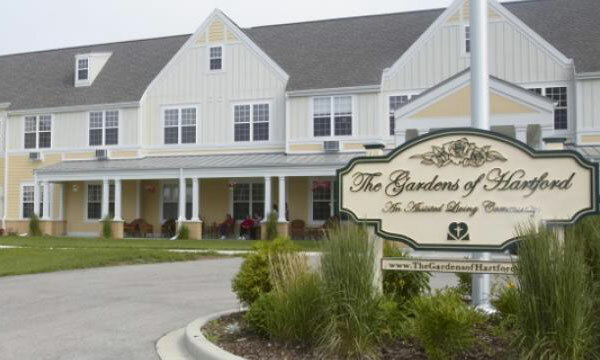 Allowing residents to stay in the community that they cherish while still maintaining their independence and receiving the care they deserve is as important to the staff of The Gardens as it is to our residents. The Gardens of Hartford is currently accepting applications for residency. To learn more and to schedule your personal tour, please call us at 262.345.5590 today, or e-mail info@wlcfs.org.